Google needs a way to earn some money from Youtube real quick considering huge daily loses being piled up. Finally, Youtube is showing some spark by showcasing premium video content on the website. Now you can watch full length movies and TV shows online. As expected, most of the content is old but still good enough to be watched for free (intercepted with advertisements). Listing including English movies like Incredible Hulk Returns, Cliffhanger to bollywood movies like Deewana, Dhaai Akshar Prem Ke. It also feature some classic TV shows (only available in selected countries) like I Dream of Jeannie, Jackie Chan Adventures, SWAT. 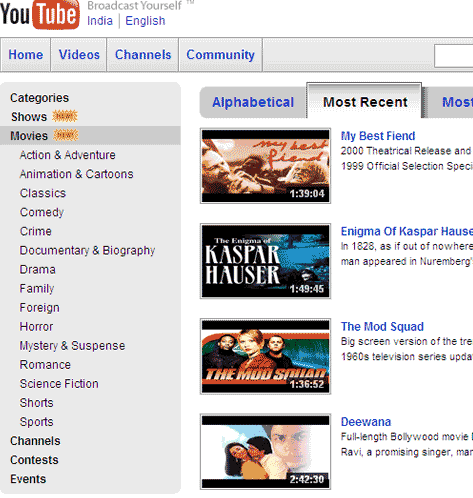 Checkout full length TV shows and Movies on Youtube. Nice beginning!